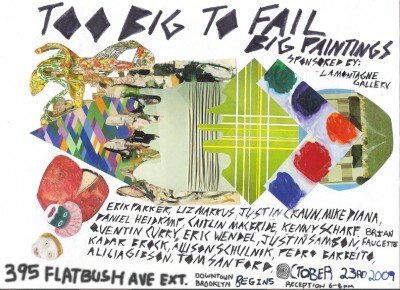 Another group show: TOO BIG TO FAIL is curated by Dan Heidkamp and is at the new NADA Gallery Space at 395 Flatbush in downtown Brooklyn, USA. ARTISTS: Erik PARKER, Liz MARKUS, Justin CRAUN, Mike DIANA, Daniel HEIDKAMP, Caitlin MCBRIDE, Kenny SCHARF, Brian FAUCETTE, Quentin CURRY, Erik WENDEL, Justin SAMPSON, Kadar BROCK, Allison SCHULNIK, Pedro BARBEITO, Alicia GIBSON, Tom SANFORD. The show is sponsored by NADA and LaMontagne Gallery. N.A.D.A. (New Art Dealers Alliance) has procured a block of large vacant commercial storefronts at 395 Flatbush Ave in Downtown Brooklyn for exhibition purposes. This show will be (partly) installed and set up by Sunday October 18th to coincide with the “Nada County Affair” event, with an official opening the following Friday the October 23rd.